Which Breakfast Cereal is best for you? During our recent dietitian Instagram takeover, the most commonly asked question was “which cereal is the healthiest cereal for breakfast?” There’s no doubt that cereal is a really convenient breakfast option, particularly when you need to rush out the door in the morning and don’t have the time for a cooked breakfast. Looking at the cereal aisle in the grocery stores, it’s not surprising that choosing a healthy option can be confusing and overwhelming. With so many varieties on the shelves, all with clever marketing hacks to make their products seem the healthiest and most appetising despite their questionable ingredients lists, I’ve decided to make it easier for you by choosing my top 5 cereals based on the below criteria. If you don’t like these cereals after trying them, using these criteria to search for alternatives will help you find the best cereal option to suit your tastes! All ingredients lists must be listed in descending order of ingredients i.e. the first ingredient of the list is present in the highest amount in that food. By looking at the ingredients list, you can immediately assess the quality of the product. If sugar falls into the top 3 ingredients in that cereal, you can assume the cereal is very high in sugar, but if wholegrains (i.e. oats) are the highest listed ingredient, then this is a positive aspect of the cereal. Those with less than 75% wholegrains as the top ingredient were assessed based on the next ingredients listed. So many cereals have unnecessary amounts of added sugars, so much that they could actually be classified as a dessert. Taking into account whether the sugar content comes from added sugars, or ingredients such as dried fruit is important in assessing the cereal. In general, I recommend aiming for a cereal that has less than 10% sugar (less than 10g per 100g). The reason I look at the fibre content of a cereal is because fibre is a great micronutrient that most people aren’t eating enough of. Females are aiming for 25g of fibre per day, and males aiming for 30g per day. Our breads and cereals food group have options that are high in fibre, but some that are not quiet as high due to being highly processed and losing some of the fibre content. Comparing cereals side by side and choosing the one with the highest fibre content is going to be beneficial. 7g of fibre or more per 100g is considered high fibre, while 0.5g or less per 100g is considered low in fibre. 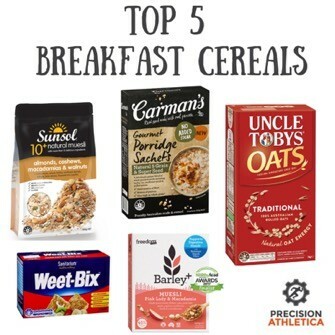 I assessed a whole range of popular cereals to find my top 5. Have a look at the table below to see how your favourite cereals add up, or keep scrolling to see the top 5 list! Oats and low sugar muesli make a great breakfast option, but are low in protein on their own so I recommend using a high protein milk or yoghurt to increase fullness and promote lean muscle maintenance and recovery. Two of the options are porridge, but these don’t necessarily need to be cooked, they can be eaten raw as rolled oats. Add some fruit, nuts and high protein milk to turn the oats into a delicious balanced breakfast. 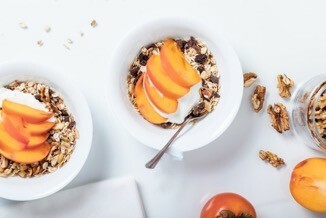 Even though I have analysed the nutrition content of common breakfast cereals available on the market, whether or not your breakfast meal is healthy or meets your requirements is individualised and depends on the context – individualised requirements and goals such as what you eat over the rest of your day and what you enjoy or can stomach for the first meal of the day will all impact this. Book an appointment with our dietitian so you can find out what a suitable breakfast for you is based on your individualised goals and requirements. If you are interested in getting a strategic nutrition plan to support your training and lifestyle goals, contact our Sports Dietitian Kelsey Hutton, who will be happy to help. Kelsey can be contact by email at: kelsey.h@precisionathletica.com.au or you can book to see her for a one-on-one below.